I can slime fish, operate a reciprocating miter saw without losing fingers and I can manage complex risk. I have entered a new stage of my career and I am offering my services as a temporary employee. No job too big. No job too small. I am happy to consider a full-time gig. I am a smidge over fifty years old (seasoned). I've been married for thirty years (likeable enough) and it looks like it will last a while longer (value partnerships). I've driven thousands of miles and have a pristine driving record (focused and compliant). I have traveled the world with a backpack (adventurous) and a business plan (ambitious). I can juggle a soccer ball more than fifty times and I am double jointed in both thumbs (functional and flexible). I was hit by a stray bullet on New Year's Eve in 2011 and bounced back to my feet (resilient). I survived a knife fight with an Aleut Indian (quick thinker) and my fifteen minutes of fame occurred during a bullfight at Plaza de Toros de Las Ventas in Madrid, Spain (pensador rápido). I believe a person can emphasize the same point in two languages without running the risk of sounding redundant. Virgo. ENTP, just like Nikola Tesla and George Carlin (let that sink in for a moment). Blood, organ and marrow donor. Operational Risk Manager: I have held positions at all levels of risk management, from a local Safety Engineer to a global Risk Manager. I am familiar with all aspects of the risk management process, from identification to measurement, control, finance and administration. I have worked for Chemical Waste Management, Dole Food Company (twice), and The Häagen-Dazs Company. I operated an independent consultancy and serviced clients, such as: Dreyer’s Grand Ice Cream; Del Monte Fresh Produce; Saputo Cheese; Dole Food Company; Woolf Enterprises; Pirelli Armstrong Tire; Ruiz Food Company; Campos Brothers Farms; Leprino Foods and others. I spent a couple decades automating the business logic of integrated risk management. Cookie Jar Closer: I authored a report which led to funding of the Fresno County Workers’ Compensation Fraud Unit. I have led the conviction of multiple workers’ compensation fraud cases throughout California. I have uncovered a complex invoicing scheme being used to pilfer direct store delivery accounts across the nation and I have led sub rosa investigations of a wide variety of fraud perpetrated by internal and external actors. Director of Change: I became a licensed Property and Casualty Insurance Broker (License #: 0C30289) to assist agency owners in their transition to a consultative, team-based, sales organization. We ultimately failed (we should talk). Business Planner: I have authored multiple business plans, one of which led to a $500k seed level investment and a Memorandum of Understanding with one of the oldest and wealthiest companies on Earth. That deal almost got me killed on a ski slope in Davos, Switzerland. No, seriously. Tech CEO: I have led proprietary and open source software development firms. 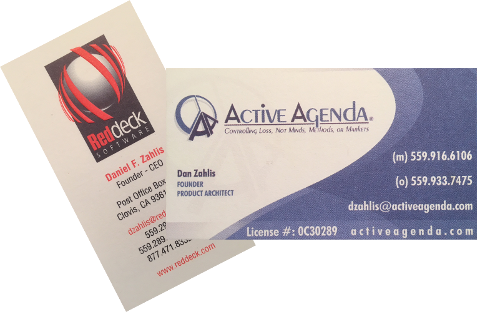 Swiss Army Knife: I have participated in marketing, sales, accounting, human resources, recruiting, tech support, executive leadership, and I've been a member of a board of directors. Pitch Guy: I have liaised with regulatory agencies, law firms and hearing judges. I've pitched to small clients, Fortune 100 company executive teams, and rooms full of private and institutional investors. Mistake Maker: I have witnessed my share of business mistakes—mine and those of others. My greatest advice comes from Jim Collins in his book Good to Great - "first who, then what." Two such mistakes involved Ben & Jerry's and Granite Construction, a Malcolm Baldridge National Quality Award winner. I still have bruises from kicking myself. Global Project Founder: I led an international team to build an open source risk management software application (Active Agenda) being used across the globe in banking, manufacturing, healthcare, education, consulting and other industries. Power User: I am a highly capable user of major software tools; such as: databases, spreadsheets, word processors, presentation development, graphic design, content management systems (I developed this site), and basic level programming. General Geek: I began working with PC’s in the early 80’s. I can sit and tinker with technology for hours on end. I was once kicked off a game server by its twelve year old host for shooting down planes while their "pilots" were on potty breaks (sheesh). I'm long in the tooth and high on the tech. Retail Sales: I managed a hardware store when I was in college. I remember turning five cent rubber washers into $20 bills by spending a little time using sandpaper to solve a simple problem. I also remember one of my employees coming to work with bare feet. He's currently a District Attorney and City Mayor (so there's that). I also worked for a retail clothing chain. Plumbing: I have worked in all phases of plumbing, from rough out to finish. I drove a fully-loaded plumbing truck with a burned-out clutch along Highway 99 in Central California when I was fifteen and didn't have a driver's license. That was before I knew anything about risk management. Well, that was before I knew anything about anything. Boiler Repair: I worked as a gofer for pipefitters and boiler repair technicians. Boilers are really cool machines and I'm pretty sure that's an oxymoron. Slimer and Longshoreman: I worked the salmon runs in Alaska. I slimed salmon on a production line. I operated forklifts on the dock and aboard container ships on the Bering Sea. I was also a greenhorn aboard crab and fishing boats (think Deadliest Catch on Discovery Channel). Prospector: I have dredged for gold in the Sierra Nevada mountains. My uncle was my partner and he kept all the gold. Honey Doer: My wife and I renovated our home using a wide assortment of hand and power tools. Zero boo-boos. Zero fights. Read that last one twice. Trade Journals: I have been a prolific author of national, award winning articles in the field of risk management. Federal OSHA has cited my work, NASA has added my articles to their internal library and I have had paid requests to republish from ARCO Refineries and the US Paper Industry. Technical Writer: I have written unique policies and programs for small private companies and Fortune 500 businesses. Noir Fiction: I authored a noir fiction novel based on my personal and professional journey through life. It's not an easy read, but nobody said life was easy, or fair. My book is a #1 BEST SELLER among immediate family members and close friends. California State University, Fresno. BSc; Health Science, Occupational Safety and Health; 1987. McGeorge School of Law. Left before it was too late. Professional Courses: Too many to mention. Courses ranged from technical, to legal, to organizational development certifications from Development Dimensions International (DDI) and LIFO by Dr. Stuart Atkins. Once upon a time, I was a CPR and First Aid trainer for the American Red Cross. Teaching: A large part of a risk manager's job is educating the workforce, from the front line to executive leadership. Some of my fondest memories were forged in the front of training rooms and conference centers. I have taken my love for teaching and secured a Substitute Teaching Permit in California. I would love to stand in the front of your classroom someday (c'mon, you know you need a break). Pedigree: Thanks to a surprise DNA result from ancestry.com, I have learned that my biological great grandfather was the president of the Fresno County Board of Education and Superintendent of Selma Schools in California. That's right; my biological surname turns out to be Edgecomb and my great grandfather Charles was a pretty big deal! He came to California in 1912 and was elected principal of the Clovis grammar school. He then went to Selma in 1916 as superintendent of the district elementary schools and he was a member of the county board of education since 1913. Teaching seems to be in my blood. School of Hard Knocks: I worked my way up the corporate ladder and worked my way out as an entrepreneur. I always do the right thing. Well, there's that time I took money from the wrong people (see "Business Planner" under Business section above). 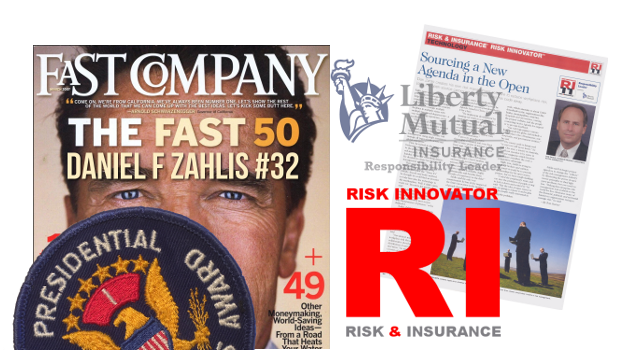 Liberty Mutual, Responsibility Leader®: A Responsibility Leader® demonstrates creativity, innovation and hard work and their efforts combine risk management success with responsibility. Liberty Mutual's Responsibility Leader® does what is right instead of what is easy. RISK & INSURANCE, Risk Innovator™: The Risk Innovator™ Award recognizes winners across different industries who have demonstrated innovation and excellence in risk management. FAST COMPANY, Fast 50: The "Fast 50" is Fast Company magazine's annual readers' challenge, a global search for people doing extraordinary things. I was #32 out of 50. I outperformed the ex-NSA guy that inspired Edward Snowden's whistleblowing (true story—read my book). Professional Paper Award: American Society of Safety Engineers; CAUTION, Beware of OSHA Statistics. While everybody else was targeting zero injuries, I was encouraging more (reporting actually). "CAUTION" inspired federal OSHA's chief recordkeeper to challenge the agency's metrics. He lost his job but he received $820k for his troubles. My paper earned me a lovely plaque. Presidential Award: I was recognized by the President of the United States (presumably, and until told otherwise) for achieving fitness above the 85th percentile, among US elementary school students.